With the upper intake manifold off to relocate the air intake sensor the next steps were somewhat straight forward. Perhaps the trickiest part is removal of the air control valve in order to gain access to the rear secondary injector. The ACV is held in place by 3 8mm nuts. Two on the top and one absolutely buried underneath. The real problem is that the solonoid rack and vacuum lines make getting a socket on that one 8mm nut underneath very VERY difficult. I ended up using a 1/4" drive ratchet with a tiny extension and socket. With the ACV moved to the side (one electrical connector must be unplugged) access to the top of the secondary fuel rail is pretty easy. How can one 8mm nut be that hard to get to? This is how. The ACV disconnected (arrows). The injectors are simply held in by a retainer cap. 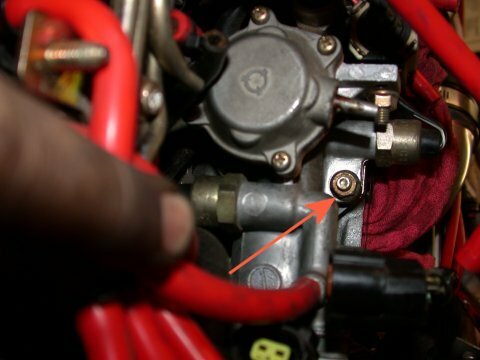 Disconnect the injector from the electrical harness and remove the retainer cap. The injector can be pulled out gently with a pair of pliers on the orange portion of the top cover. Mine came out pretty easily with twisting pulling motion. The secondary fuel rail clearly visible. And the rear injector with retainer cap removed. 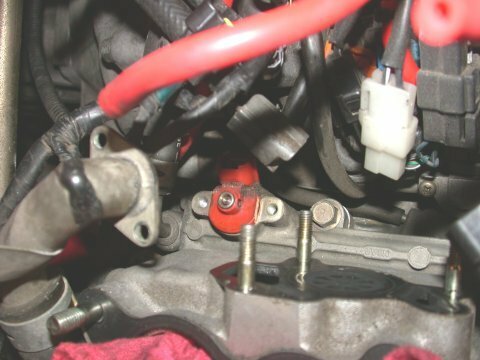 With the factory injectors out check the socket for debris or anything that might inhibit a good seat of the new injectors. 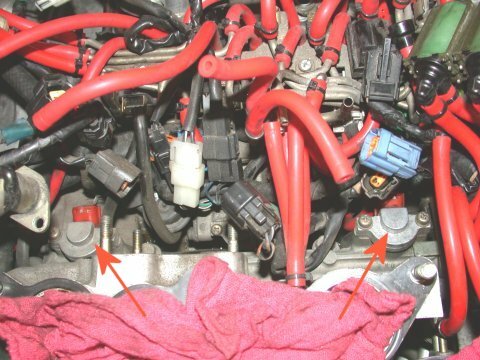 It is imperative the injectors seat perfectly or else a fuel leak is a certainty. With a side feed injector there are two O-rings. 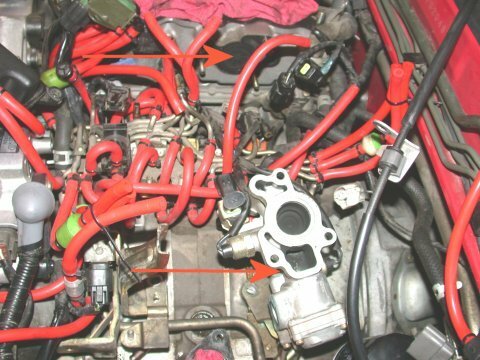 The upper prevents fuel from leaking out into the engine bay and the lower prevents fuel from bypassing the injector and dumping directly into the intake. 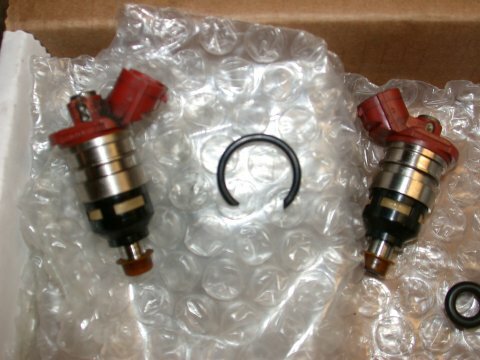 Without a perfectly seated injector both will occur resulting in fuel dumping onto the floor under the car and a car that won't run. Don't ask me how I know! So when installing the new injectors use a little bit of bearing grease or engine oil on the O-rings (the injectors will come with new O-rings - never re-use the old ones) and push them all the way in by hand. Do not use the retainer caps to press them as you tighten the screws. There would be a good chance you will pinch an O-ring. Don't ask me how I know. See a trend here? With the injectors in, simply reassemble in reverse order: retainer caps on, injector plugged in, ACV reconnected, etc. It is adviseable to pressure test the fuel rail per the FSM to ensure you have no leaks before completing the reassembly. And a trick to getting that lower 8mm nut back on the ACV is to put a small piece of paper in the socket and wedge the nut in the end of the socket so it won't fall out until it's on the stud and you pull the socket off the nut. 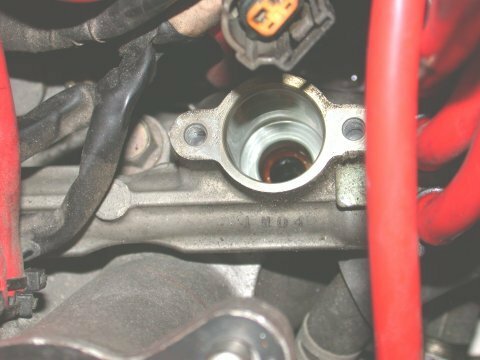 An injector socket and how NOT to install an injector - pinched O-ring. So there you have it. Not much to the install really. Most of the effort is just getting to the point where the UIM has been removed. The next step is to make any tuning adjustments on your ECU to accommodate the larger secondary injectors. With the Apexi Power FC and Datalogit this is fairly elementary. 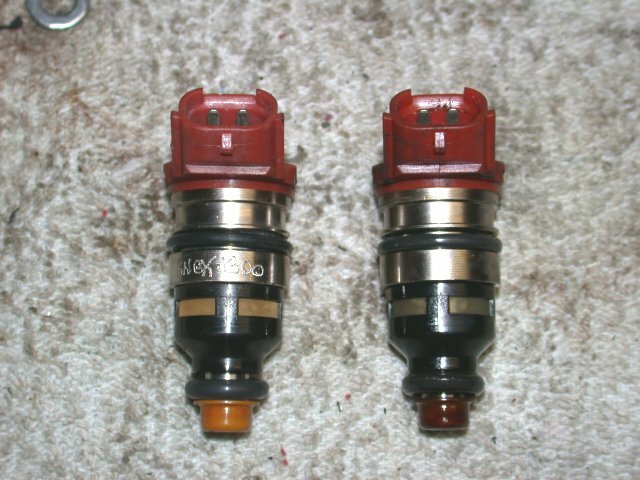 In addition to, of course, changing injector size to from 850 to 1300. To prove that all worked as intended a few pulls to redline at 12psi while datalogging indicated a peak fuel injector duty cycle of only 79%. Exactly where I'd hoped it would be. And with a smooth injector transition. As a sidebar to my work installing the new injectors, this fairly straightforward 4 hour job turned into a 15 hour nightmare. After installing one injector and not getting it seated properly due to a pinched O-ring, I opened up the car again to see what was amiss. In the process of removing the ACV, and being somewhat annoyed that I'd screwed up the job somehow, in my haste I neglected to cover the lower intake runner ports, and as if God had willed it himself I dropped one of the 8mm ACV nuts straight down the intake runner! Click here to see what transpired next.